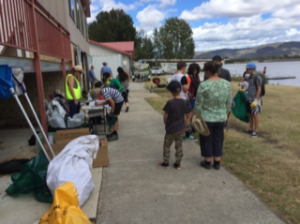 The Tuggeranong Lake Carers (TLC) with the support of the Tuggeranong Community Council and the Southern ACT Catchment Group, are organising a Clean-Up of Lake Tuggeranong on Sunday 23 September, from 10am to 1pm. Meet and register at the Sea Scout Hall on Mortimer Lewis Drive, East Greenway and bring gloves, a hat and water bottle. The Tuggeranong Community Council is putting on a free BBQ near the Scout Hall for all participants. 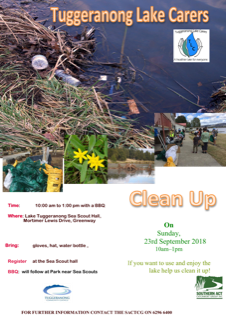 Please come, meet others and help clean up the lake.